Orion the Hunter will be at its highest point in the evening sky this month. By late March, you will notice him sliding back down toward the western horizon, just a bit lower at the same time each successive evening. 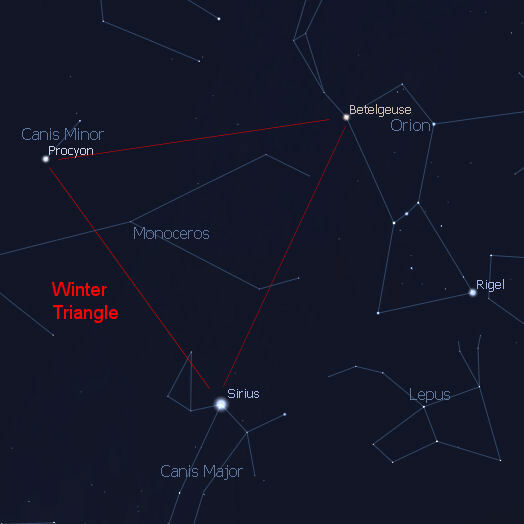 Orange super-giant Betelgeuse (BEE-tel-joos) at Orion's upper left shoulder forms one apex of the Winter Triangle, with Procyon (PRO-see-yon) and blue-white Sirius forming the other two. Procyon and Sirius are the brightest stars in the two constellations that represent Orion’s faithful hunting dogs, Canis Minor, and Canis Major, respectively. On the Apparent Magnitude scale, the higher the number, the dimmer the object, so Procyon, which is Magnitude 0.45, is dimmer than Sirius, at Magnitude -1.45. Sirius is considered the brightest star in the night sky. Venus is much brighter, at Mag -3.80. The International Space Station (ISS) and Iridium Flares can both be brighter than Sirius, and sometimes even brighter than Venus. This week, the ISS will be almost as bright as Venus on Wednesday morning (Mag -2.9), when it passes overhead at 6:00 AM, swinging from an altitude of 20° in the WNW, up to about 43° in the SW and then back down to 10° in the SSE. There will be four Iridium Flares visible this week, on Thursday and Friday evenings, and also Friday and Saturday mornings. These flares will be approximately Mag -2.0, so they will be brighter than Sirius in the evening and pre-dawn skies. 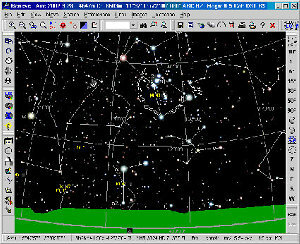 Look for them in the south at 6:58 PM on Feb 25 (Iridium 66), and 6:52 PM on Feb 26th (Iridium 21), at an altitude of 48°. The flares will also be visible in the south at 5:35 AM on Feb 26th (Iridium 18), and 5:29 AM on Feb 27th (Iridium 39), this time at an altitude of 39° above the horizon. The Moon entered First Quarter on Sunday, Feb 21st, so it will be waxing gibbous all week, reaching Full Moon by Sunday, Feb 28th. It will be high in the sky by 8:00 PM on Monday evening, and will then be lower in the east each successive evening. Look for the Moon between Castor and Pollux, the twins of Gemini at 8:00 PM on the 24th. By the 25th, the Moon passes within 5° of Mars, and by the 27th the bright nearly full Moon will be only 4° below Regulus, the front shoulder of Leo. Remember, the width of your index finger held at arm’s length is about 1.5°, so three fingers would be about 4.5°. Fiery Mars is past opposition now, so it won’t be as bright as it was last month, but it’s still a great target in a small telescope. Mars rides high in the sky this week, in a line below the twins of Gemini, about halfway between them and M44, the Beehive Cluster. Look for Mars in the eastern sky at 8:00 PM. Saturn will be rising in the East just before 8:00 PM on the 27th. You can catch Saturn’s largest moon, Titan at about the 1:30 position in a pair of binoculars or a small telescope anytime after 8:30 PM. Remember that most telescopes either invert the image or mirror it, so you might have to look at the 7:30 or 10:30 position in your scope, unless you have an erect-image prism in the optical train. 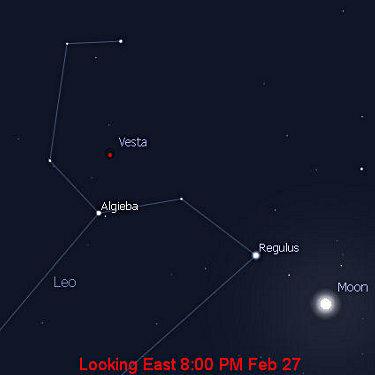 The bright asteroid Vesta, is just past opposition and still at magnitude 6.1. Vesa continues its travels across the Sickle of Leo, as shown in the last image. You should be able to spot it in binoculars. The real astronomical treat this week will not be planets, stars, or even comets, but man-made objects in the heavens. Iridium Flares are the result of sunlight reflecting off the surface of Iridium Satellites as they pass overhead. Flare from Iridium 84, November 20, 2006 at 7:06 PM CST. Andrew Echols Photo. Iridium Satellites are telecommunication satellites launched in 1997 and 1998. There are about 70 Iridium Satellites currently in orbit. What makes them interesting is that their particular shape and antenna configuration contribute to the occurrence of very bright flares – sometimes so bright they can be seen in daylight. The flares last only a few seconds, but are most impressive at night. 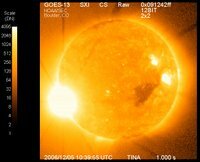 You can view a flare simulation on Wikipedia. These flares can reach a brightness nearly twice that of Venus at maximum, or nearly −8.0 in apparent magnitude, a measure of the apparent brightness of an object in the night sky when viewed from Earth. Although there will be several flares over the next week, there are two that will be visible in the evening. On Wednesday evening, January 20th, Iridium 50 will pass overhead to your NE at approximately 6:55 PM. Look for it at about 52° above the horizon. Remember – straight up (the zenith) is 90° above the horizon, so 52° is more than halfway from the horizon to the zenith. To make sure you see it, start observing at about 6:50 PM CST, and continue until at least 7:00 PM. It’s even better if you have several people looking in different parts of the sky. On Thursday, January 21st, Iridium 53 will take nearly the same path across the sky, but just a bit earlier, at 6:49 PM CST. On Thursday, start looking at 6:45 and continue until about 6:55 PM. Look to the NE at an altitude of about 52° If you’re adventurous, Iridium 54 and Iridium 13 will pass at a low altitude of 22° in the SSE just after sunrise at 6:25 AM CST on Thursday, January 21st and at 6:10 AM CST Monday, January 25 respectively. These may be difficult to spot, but they are bright enough to see for sharp-eyed observers. Saturn as viewed in a small telescope, 1:00 AM CST Thursday, January 21, 2010. The International Space Station (ISS) will also make several bright passes in the evening this week, each brighter than Sirius, the brightest star in the night sky. The ISS is visible over a much larger path in the sky than Iridium Flares, and consequently stays visible for a longer period of time. On the evening of Thursday, January 21st, the ISS will pass low in the N starting at 6:09 PM CST. It will swing higher to a maximum altitude of just 16° above the horizon in the NE, then pass low to the ENE over a period of about 6 minutes. You can estimate 15° of altitude on the sky by viewing the width of your fist held at arms’ length. Observers get another chance at ISS on Friday, January 22nd. This time, the ISS will rise above the horizon in the NW at about 6:30 PM CST, swing high overhead to about 45° altitude in the NE, and then sink back to the horizon in the ESE, again over about a six minute period. On Saturday, January 23rd, the ISS makes another pass from the NW at about 6:51 PM CST over to the SW at a maximum altitude of 40°, and then back toward the horizon in the SSW at about 6:58 PM. Amateurs have reported seeing the shuttle docked at the station in small telescopes as it passes overhead in the past. However, no shuttle missions are in progress at this time. Also, Mars and Saturn dominate the eastern sky after sunset once again this week. Mars rises at about 6:30 PM CST, and is high enough in the East by about three hours after sunset to see clearly in small telescopes. Saturn rises much later - after 10:30 PM. It will be 1:00 AM or so before Saturn is high enough above the thick eastern atmosphere for observing. 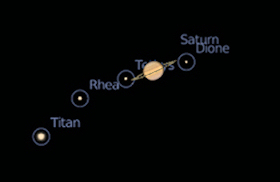 You may spot several of Saturn’s largest moons, including Titan in a small telescope. January 2010 is a great time to observe Mars. This is the time just before the Red Planet passes closest to earth in its 687-day journey around the Sun. When Mars appears bright in the night sky, it is in opposition to the Sun, meaning that it is opposite the Sun in the sky as seen from Earth. It is also closer to Earth at this time than at any other time in its orbit. As such, this is when it is brightest and best positioned for observational study. Whenever Mars or any other planet is visible in the night sky for a period of weeks, this entire period is said to be a single apparition. Mars’ latest apparition began several weeks ago. 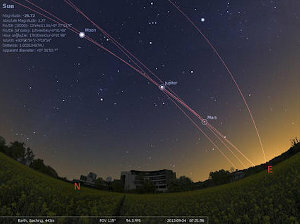 This week, you will see it above the eastern horizon early on clear cold evenings as a bright ruddy “star”. By 9:00 PM, it will be high enough above the horizon that you can view Mars without the usual distortion caused by the thicker atmosphere lower on the horizon. Mars will actually make its closest approach to us in its orbital cycle on January 29, 2010. As Mars approaches opposition it begins a period of retrograde motion, which means it will appear to move backwards in a looping motion with respect to the background stars. This is due to the fact that Earth passes Mars in its orbit. So initially, we see it in front of us, and then as we pass, it falls behind. The duration of this retrograde motion lasts for about 72 days, and Mars reaches its peak luminosity in the middle of this motion this coming March. Careful observers should be able to identify the larger features on Mars’ surface using a small telescope. These include the polar ice caps and Syrtis Major, which appears as the largest dark splotch on Mars. These darker areas were once thought to be seas or canals, but have been revealed as areas of darker rock with less dust than the brighter surroundings. Also this week, Jupiter is low in the southwest just after sunset. Jupiter will continue to get lower in the western sky every evening until it sinks below the horizon. On Jan 16, if the sky is clear, look for the waxing crescent Moon very low on the western horizon. 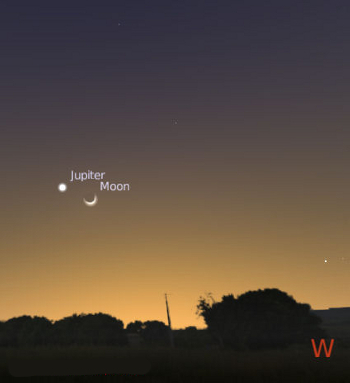 By the evening of Jan 17, the Moon will be very close in conjunction below Jupiter in the western sky. A conjunction occurs when two or more celestial objects appear very close together in the night sky. 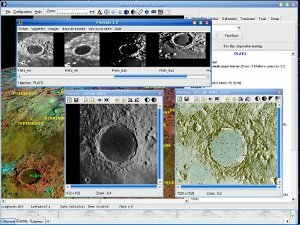 With the colder weather and snow this time of year, astronomical observing is usually limited to fairly short sessions. Although the cold is hard on the observer, it is also hard on the equipment. So, naked-eye targets are ideal for winter observing. At midnight on Tuesday evening, the Moon rises very close to bright, pale yellow Saturn, and will be far below the Red Planet (Mars) in the sky. This week, the Moon enters Last Quarter at 4:39 AM CST on Thursday morning, so it won’t be quite as bright as it was on New Year’s Eve. Saturnian Moons, 4:00 AM CST, Jan 7, 2010. With the aid of a small telescope, you may also be able to see Titan, Saturn’s largest moon in the early morning hours if the sky is clear. At about 3:30 AM all this week,Saturn is high enough in the sky to rise above the “muck,” which is what astronomers call the thicker part of the atmosphere that we must look through when objects are close to the horizon. 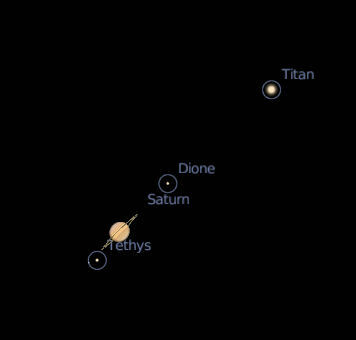 A view in a small scope will show Titan off to the right at about 2 o’clock. 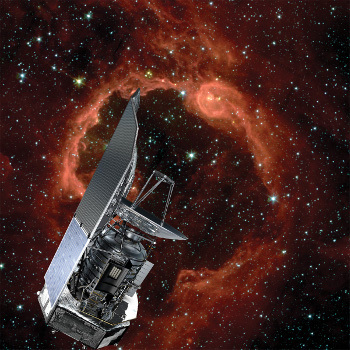 The image shown here will be reversed in the telescope’s field of view. Early January is also a great time to observe the Great Orion Nebula, as it is in an ideal position by about 10:00 PM on these cold winter nights. The constellation of Orion rides high in the South-Southeast in late evening all week this week, and the Great Nebula is a special treat for anyone with a good pair of binoculars or small telescope. Orion is recognizable by his belt and sword. The Full Moon on Thursday, December 31st marks a rare ending this year. There are normally 12 full lunar cycles in a year, but some years have 13. The thirteenth moon is sometimes known as the Blue Moon. 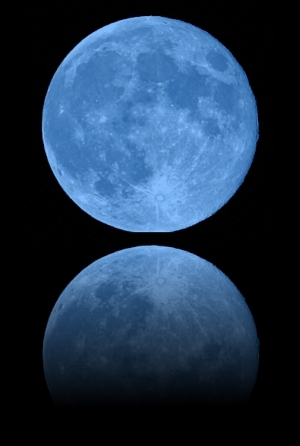 Although different definitions place the blue moon at different times of the year, at least one definition places it at the end of the year. A March 1946 article in Sky and Telescope magazine by James Hugh Pruett misinterpreted the 1937 Farmer’s Almanac to mean that the second full moon in a calendar month was called the Blue Moon. This “misinterpreted” definition of a Blue Moon has come into widespread use in recent years after it was revived on the January 31, 1980 installment of the popular radio program StarDate. There are several other astronomical definitions for a “Blue Moon”, but the two cited above make this coming Thursday’s Full Moon a Blue Moon. By either definition, this only happens every few years. Just remember — it’s referred to as a blue moon, but the Moon won’t look blue — it will look the same as any other full moon. Planet, in Greek, means wanderer. These objects are so named because they appear to move from night to night against the fixed background of the stars. 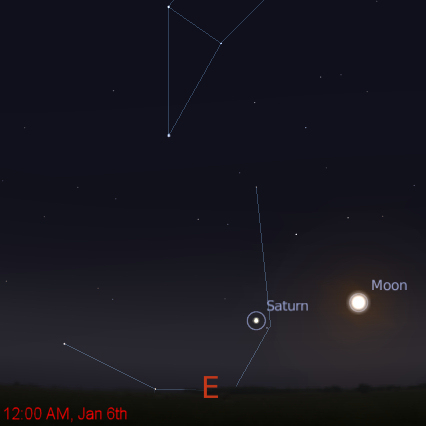 A feast of planets is visible in the evening sky this week, even with the glare of the Full Moon. 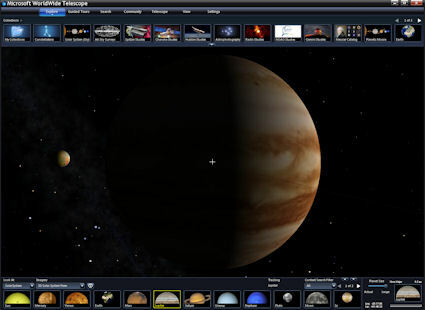 Jupiter, known as the King of Planets, will be visible as a bright object low in the southwest just after sunset. Jupiter sets in the west by about 9:00 PM, and will only be visible in the evening sky for another month or so. After that, it sinks below the horizon before sunset - too early to be seen for observers in our part of the world. Binoculars or small telescopes will reveal Ganymede, Callisto, Io, and Europa, the four brightest moons of Jupiter. Observing these at different hours of the night and on subsequent nights will show obvious movement with respect to each other and Jupiter. So far, scientists have discovered over sixty three moons orbiting the giant planet. Neptune is approximately 1-1/2° lower toward the western horizon than Jupiter, and is much harder to spot. A small telescope will reveal it as an obvious disk with a blue-green cast, rather than as a point source. You can measure 1° on the sky by the width of your pinkie finger held at arm’s length. Neptune will set only about 6 minutes earlier than Jupiter. Saturn presents a great observing target for those who might be awake in the early morning hours. Saturn’s rings are at just 4° from edge-on right now, so the planet looks much like a “spike in a ball” in small telescopes. The ring angle will open somewhat in 2010. Saturn will be rising in the east just before midnight, and will be appear to be a bright object with a slightly yellow cast. Small telescopes will reveal the rings and perhaps up to six of Saturn’s brightest moons — Titan, Hyperion, Rhea, Dione, Tethys, and Mimas. These will be stretched out along the same plane as the ring system. Of all the moons in the Solar System, Titan is unique in that it is the only one that has an atmosphere. Saturn has over sixty-one known moons. 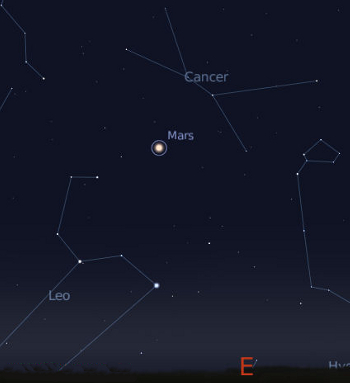 Mars rises big and bright at about 8:00 PM and should be visible all night. Mars is in one of it’s close approaches (or opposition) to Earth during the month of January, and should be easy to observe. Small telescopes should show enough detail to see the markings or “canali” that lead early observers to believe there was an active civilization on the Red Planet. These markings were first observed by Giovanni Schiaparelli during the opposition of 1877, and he dubbed them canali, which is Italian for canals or channels. Improved astronomical observations in the early 20th century proved this to be false. Look for Mars in the east as a brilliant object with a ruddy hue. 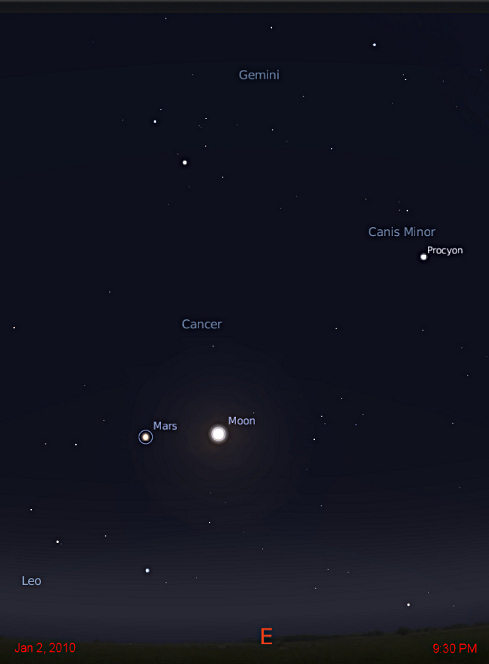 On Saturday, Jan 2nd, Mars and the Moon will rise together about 7° apart in the eastern sky. For reference, 7° of sky is about the width of four fingers held at arm’s length.